Make everything taste like bacon with bacon flavored salt. 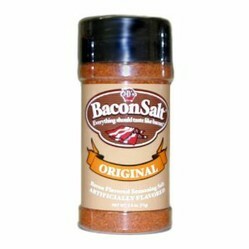 For anybody that loves the taste of bacon, bacon flavored salt is the ultimate condiment. It can be used on pretty much everything that needs seasoning, and brings the smoky taste of crispy bacon to meals without the greasiness and calories of actual bacon. J&D's is the brainchild of two ordinary guys named Justin and Dave. Over a business lunch one day, the two got to discussing their mutual love of bacon, and the idea for bacon salt was hatched. In 2007 the first bacon salt hit the shelves and was met with wild success. Since then Justin and Dave have gone on to create many other great bacon flavored products including Baconnaise (bacon flavored mayonnaise), bacon popcorn, bacon flavored croutons and gravy, and even bacon flavoured lip balm. Bacon salt is made with natural flavors like garlic, paprika and onion, and it does not actually contain bacon. This means it is a great condiment for vegetarians or those on a kosher diet who love the taste of bacon but not the actual meat itself. In addition it is low in calories and fat and also low in sodium. There are tons of flavors of bacon salt to choose from. The Original flavor has straight up bacon taste and goes well on pretty much everything, including sandwiches, eggs, soups and french fries. The Hickory version has a slightly smokier taste than the regular and is the favorite of Dave, the creator. Peppered is spicy and strong, and an excellent addition to Bloody Marys, tomato soups and steaks. As its name suggests, Natural contains only natural ingredients and no artificial ingredients, so it is a healthy option. Other great flavors include Applewood, Maple, Cheddar, Jalapeno and Mesquite. What Can You Use It On? Bacon Salt can be used on pretty much anything that you want to add the delicious taste of bacon too without the calories and mess of actual bacon. Popular food items that Bacon Salt is used on include, grilled meats, sandwiches, salads, potatoes, eggs, soups and pastas. You can even get creative and add it to cocktails, dips, sushi, and popcorn. And with such a broad range of flavors to choose from, it's easy to find a Bacon Salt to match any meal. Where Can You Buy Bacon Salt? J&D's is an American company, so there are quite a few stores across the United States that stock their products. For those outside the United States, or for people that don't have access to a store with J&D's products, Bacon Salt and other bacon flavored products can be purchased here through Amazon. Orders can be shipped directly to your front door, and there is even a gift wrapping option for those that want to give Bacon Salt as a present for the bacon lovers in your life. Hickory - a little more smokey than Original, but not in that fake liquid smokey type of way. Potatoes, Steaks, Tomato Soups, Salmon, Cream Cheese Dips and more. Curry is a mixture of spices used in Indian cooking and in many other recipes. Come see how curries are made from the raw ingredients. Find some recipes in which you can use curry.